Leading to the entrance of Great Point, the Wauwinet Road is home to one of the most elegant and luxurious resorts on the Island, the Wauwinet Hotel. If you're not staying there, stop in for afternoon tea, or just visit the waterfront lawns and gardens. Most homes in this private, quiet area are nestled behind trees. Great Point/Coatue Wildlife Refuge One of the treasures of the Island, Great Point is accessible only by 4-wheel drive vehicles. You could rent one, or take a guided tour with the Trustees of Reservation. The Maria Mitchell Association also leads guided birding and wildflower walks during the summer. 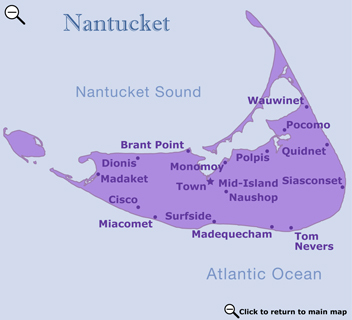 On your way out to the Great Point Lighthouse and the bird sanctuary, hear about Nantucket's wildlife, habitats, and natural history. Great Point has some of the most exotic bird watching on the island. Its 7 ½ mile long stretch of beautiful and private beaches offers spectacular views over Nantucket Sound and an abundance of wildlife. This area is cooperatively managed by three wildlife refuges. Enjoy swimming, snorkeling, and fishing on both the Sound side and in the harbor. Because of dangerous currents and rip tides, swimming is strongly discouraged within 200 yards of Great Point Light. This area, however, is a great place to watch the gray and harbor seals as they feed on fish in the feeding ground the rip tides create.